The main goal of ESLP-2017 is to bring together researchers using embodied approaches in their study of language in its interaction with visual and motor processing. Researchers from different disciplines (Neuroscience, Linguistics, Cognitive Sciences) are welcome to apply. 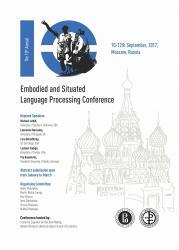 ABSTRACT DEADLINE TO ESLP2017: Extended deadline: April 3rd.